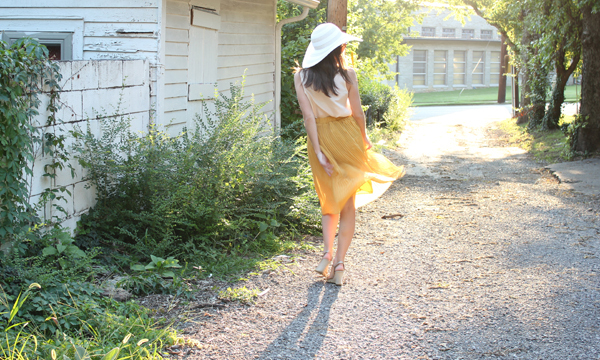 The blogosphere is buzzing with excitement about Fall fashions (and while I am admittedly too!) I want to savor these last few weeks of summer... after all, I still have things to do! A sun hat kicks any outfit up a notch! Any thing left on your summer bucket list to be checked off? P.S. I received this skirt through participation in the Oasap Fashion Hunter's program. I picked out this skirt using credits provided to me, and all opinions are my own. What to join me and the other Fashion Hunter's? What are you waiting for? This skirt is amazing! I've been so excited for fall, but this look is so pretty and cheerful that it's making me reconsider. You look lovely! Newest follower, hope you can check out my blog www.nellecreations.com and follow back if you like it! I love the skirt. It is beautiful. And I am trying to savor every last bit of summer as well. I love the color of this skirt! these pictures are beautiful!! you are so stinkin cute! Simply divine! That first picture is GOREGOUS...I mean they are all beauts, but oh my that first one...FRAMER or Pinterest worthy!!! Such a perfect look, my lady!! amazing hat and wedges!! so chic top and pleated skirt!! love the color!! Lately I've been so excited for fall, but I still want to soak up some more of the summer too! I love this skirt, the color and pleats are so pretty! That hat is pretty fab too! You look great. First off, these photos are stunning! The lighting is beautiful. Gotta love photoshoots during the golden hour. And second, the skirt is beautiful as well. OASAP has some great pieces. I love the color and the length is very classic. It makes me want summer just a little bit longer! Oooh I love this outfit!! You look so glamorous! That skirt screams summer, I love it! Very nice skirt! Did I tell you I got rejected by Oasap fashion hunter program for not having enough followers. Tragic! You can totally wear this skirt in the fall with tights! I totally agree with holding onto the last rays of summertime. After all, it's still August! How fabulous are you, your entire outfit, and these pictures?! Love! I love your hat.. its so cute! Beautiful look and outfit! I love it all. LOVE the skirt- you sassy thing, you! You look gorgeous Jessica! 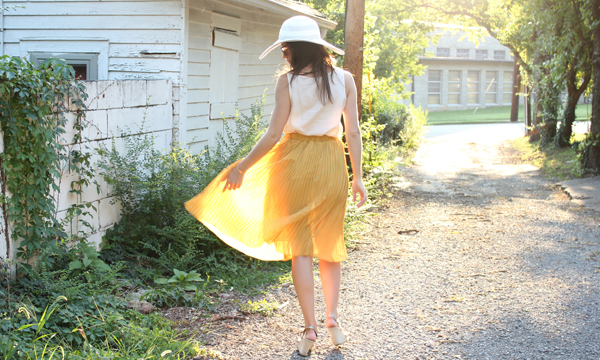 Love the pleated skirt and your hat! I adore this outfit. Are you still taking photos with a remote? Because if you are, these are stunning. I love the second photo and the last one. They are making me want that gorgeous flowy skirt. You pull that skirt off wonderfully. The lighting in the pics goes so well with the color scheme! Beautiful, amazing outfit. You look like a movie star. Happy to have found you thru the IT LIST.....love you awesomely sweet end-of-summer outfit!! okay. seriously? jessica. this is gorgeous! you look amazing.